☀ The greenhouse can hold enough plants, gardening tools, etc, even the large plants. Tie the cover to the frame so that the greenhouse will be sturdy and stable. 4 plastic stakes and ropes make the greenhouse more stable, can prevent it from blowing away. ☀ This green house is ideal for your backyards or homes; place on a deck, patio, or garden, it features UV protection, weatherproof and insect prevention, will create a perfect room for your plants. 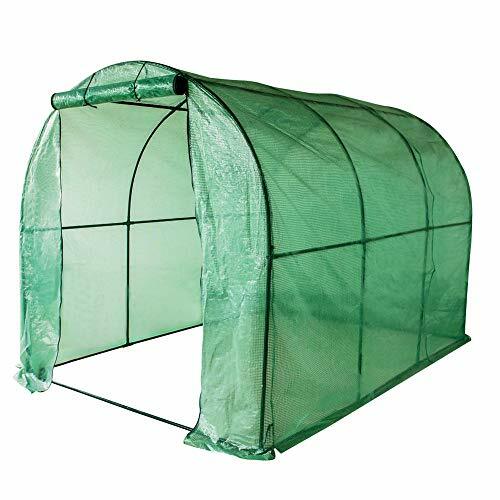 ☀ Roll-Up zippered door makes it easy to get in or close the greenhouse. Zip up and provide a warm and windless room for your plants, where your plants will grow up safely. ☀ Assembly required. Strong push-fit tubular steel frame and PE cover assembled without any tools, a simple instruction manual is provided in the box. ☀ Product dimensions: 114.8"(L) x 77.4"(W) x 76.4"(H). Please search ASIN B078J2CV49 to get 3 PCS garden tool set, ASIN B078HR77CG to get 5 PCS garden tool set.